1. SAMSKARA VARGA;CULTURAL CLASS: Weekly Cultural class for children at 3 places, 138 children. 2. SWADYAYA VARGA: Study circle for youth- 1 place- 14 people. 3. YOGA CLASS: 2 PLACES- 162 People attended . Apart from Yogasanas morning prayer, karma yoga shloka sangrah, krida yoga and bhajans in different days. 4. BHAJAN, VISHNUSAHSRANAMA CHANTING: Every Ekadashi Day Vishnusahasranama and Ramanana chanting. Daily Bhajan. 5. NON-FORMAL EDUCATION-ANANDALAYA: Free Coaching class for Class 2nd to 9th standard students. 36 students attended. 6. SPOKEN ENGLISH CLASS AND COMPUTER COACHING CLASS: 59 Students took training. NIRVANA DIWAS: On 4th April, Swami Vivekananda’s Nirwan-Diwas observed. Morning all yoga participants chanted Vishnu Sahasranama and Karmayoga shlokas and offered flowers to Swamiji. GURUPOORNIMA: Utsava celebrated on 22nd morning in yoga varga. Bhajan, guru shloka, karma yoga shlokas chanted. Samuhika Sri Satyanarayana Pooja performed at Kendra office. 76 people attended the pooja. Sri G R Vishwanthji, Manager ( Retd.,) Canara Bank talked about omkara and its significance. He also talked about Swami Vivekananda & Sri Ramakrishna Pramahamsa, Chatrapati Shivaji and Samartha Ramdasa, Hakka, Bukka and Vidyaranya. 40 welwishers attended the function. There was a guru shloka competition, Guru Bhajan, story telling etc for Anandalaya and Samskara varga students. 38 students attended. Sri Kanakaraj ji, Mangager, Corporation Bank narrated the stories of Maharshi Veda Vyasa. Independence Day: On 15th August, we celebrated Independence Day. Sri Parthasarathy, Retd. Manager General insurance talked about great freedom fighters and told about his experience at Arunachal Pradesh and VKV. On 22nd August, Ma. Eknathji’s punyathiti observed Geeta Chantaing and Vishnu sahasranama chanted and talk on Ma. Ekanathji. At the end flowers offered to Ma. Eknathji. Sri Krishna Jayanthi Celebration: On 28th August Kendra organized quiz on Sri Krishna for R B I Campus samskara varga students at Ganesha Temple, Note Mudrana Nagar. 46 students from class 1 to 10 participated. Fancy dress competition for kids, children dressed Sri Krishna and Radha and at the end there was “ Vittal Pindi” or breaking the pot programme for boys, girls, parents separately. Anandalaya children celebrated Krishna Janmastami. Quiz, Bhajan on krishna , Karma yoga shloka and at the end breaking the pot programme arranged. On 31st August, one Day Personality Development Camp held. Sri Purushottama Rao was the resource person. 42 students from P U and College attended the programme. Universal Brotherhood Day Celebration: On 8th September, Kerala Nair Samaja, Mysore and Vivekananda Kendra, Mysore jointly celebrated 150th celebration at Shivananda Jnanlaya. Bhajan, Aishwarya Laxmi Pooja and Sri Nagesh ji, Vivekananda Kendra talked on Swami Vivekanand and Why 150th celebration ? Swami Veereshanandji of R K Math, Mysore gave ashirvachana. On 11th Universal Brotherhood Day celebration held. Dr. Sridhar, Dean, Manasa Gangotri was the chief guest. He talked about Man making and Nation Building Education and also why Bharat Jago Doud? Sri Laxminaraynji and Smt Nagaratnamma distributed the prizes. GEETHA JAYANTHI:- Inter school Geeta recitation, Bhagavadgita Quiz competition conducted. 136 students from Nursery to 10+ 2 attended. Sri C V Gopinathji, Retd. Additional Secretary, Govt. of India, inugarated the function. Nearly 100 parents also attended the program. VIVEKANANDA JAYANTI AND SAMARTHA BHARATA PARVA CELEBRATION: Samartha Bharata Parva and Vivekananda Jayanthi celebration from 25.12.2013 to 12.01.2014. Pushpanjali programme at 2 places. Swamiji’s picture pasted in 3912 houses. Kalpataru day observed on 1st January. 12.1.2014 Vivekananda Jaynati celebrated at Kendra. Smt. Padma , Retd. Teacher and well known poet did Deep Prajwalan and Dr. A.S. Chandrashekar, Nagara Sanchalak presided the program. Geeta Roopaka–Swamiji’s life and message through songs conducted by Smt. Dharithri Ananda Rao and her students. Smt. Padma Vishwanath and her students conducted Bhajan on Swamiji, Sri Ramakrishna and Ma. Sharada Devi. Dr. AS Chandrashekarji talked on Swamiji. At the end all offered flower to Swami Vivekananda. WEL-WISHERS MEETING: On 21st Ma. Balakrishnaji, Vice-president, Vivekananda Kendra Kanyakumari addressed well-wishers meeting. He briefed the recent activities of Kendra and Kanyakumari. 22 people attended the meeting. 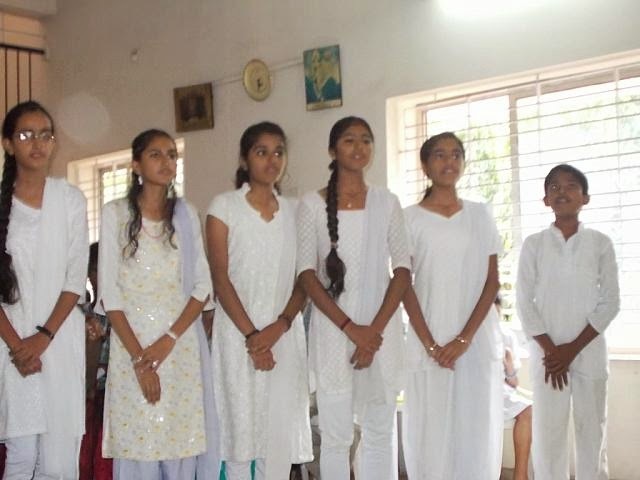 10 Days Personality Development Camp for Meghalaya students:– A Personality Development Camp for students from Meghalaya at Sri Sri Pejawara Swamiji’s Free Hostel at Jayaprakasha Narayana Nagar, Mysore. Surya namaskar & Yoga, patriotic songs, Bhajan, creative games, shlokas and stories are the part of camp. 28 students from class 1 to 8th standard attended. SARASWATI POOJA: 10th October Saraswati Pooja held at Vivekananda Kendra, Mysore. All Anandalaya children worshiped Goddess Saraswati. Children took part in Bhajan session at 6 pm. At the end Prasadm distributed to all children. OMKAR MEDITATION: 7-days Omkar Meditation Class conducted for 18 people attended. Inter school Cultural Competition: Inter school and inter college patriotic song, essay and drawing competition held. Dr. Vidhya R Bhat, Dept of Statistics, Yuvaraja College and Sri Laxminarayanji inaugurated the event. 229 students from 16 schools and 6 colleges participated. 134 students wrote essay on “ important incidents in the life of Swamiji and 57 students wrote “Swamiji’s influence on India’s Freedom Movement”. 07.1.2014 to 11.1.2014 Patriotic song. Folk song, Drawing, Devotional song, Rangoli, Traditional games competitions held. Smt. Janaki, Smt. Lakshmi, Kum. Rashmi, Sri Nagabhushan were the judges for these events. More than 1000 students participated in these events. Every day participants offered flower to Swamiji. University level Essay Competition: Mysore University level competition held. 184 students from 63 colleges from Mysore, Hassan, Mandya and Chamarajanagar participated. Quiz Competition: Quiz on Swami Vivekananda, Ramayana and Mahabharat conducted on December 28th for college and high school students. 274-students participated. Patriotic song & Essay Competition: On 30th December, patriotic song and essay writing conducted for primary, high school and college students. Around 108 students from different schools and colleges from Mandya participated. Youth Camp: 9 camps held during the year. More than 1000 students participated. Songs, Group discussion and presentation, games etc are other activities in the camp. Free Eye Camp organized. 147 people benefited.